We’ve been buying and drinking quite a few locally produced wines this summer. I love to visit the vineyards in the beautiful weather and I have some extra wine dollars as I needed to stop my clubs for the summer due to the heat, so what better way to spend them than on local wines? I picked up this bottle of 2006 Breaux Vineyards Jolie Blond when we went to Breaux for their Key West Wine Fest, which I’ve been extremely negligent in writing up. 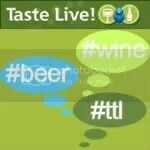 You can hop on over to DC Gastronome where I noticed Leah had put up a very timely review of the event! I believe the wine cost around $16, was newly released that day, is 12.6% alcohol by volume and had a real cork closure. The wine is actually a Seyval Blanc, a grape I am not altogether familiar with, though I understand it is a French hybrid grape. On the nose I found peach, lemon, and just a slight hint of oak. I would describe the nose as crisp. I didn’t notice any oak in the mouth at all. I got citrus flavors, mostly orange and lemon. Overall the wine was crisp and light and quite dry. We drank this on its own late on a hot Virginia night when no amount of AC would cool our house down. It was really refreshing and a great end to the evening. Is that a flower in your glass? Breaux also has a lovely Viognier and dry rose. If you feel like spending some money, their reserve Nebbiolo is quite good as well. Hillsborough, practically next door, also has some great wines. Love the blog! It’s a glass with a flower design Foodette! Thanks Chris! Glad you came to check it out!